You know Fully Spun Sock, but you don't know the REMIX! Subscription club spots open now! Pick your favorite color and make yourself a fabulous squishy #cardizen with our project kits. This fabulous sweater was designed by Bayron Handmade and is taking the knitting world by storm! Check out our newest shop update with 5 colors of Fully Spun Sock Sport and 4 colors of Original DK! Here at Fully Spun, I hand-dye wool roving. I then ship it to a mill, and wait anxiously for it to be returned to me as beautiful yarn with a wonderful marled effect. Every strand has multiple colors and the colors fade into each other in variety of color gradients. 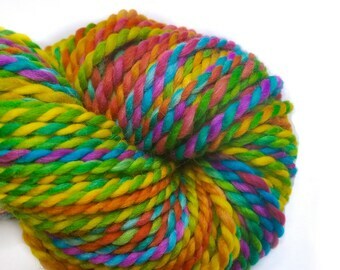 This yarn is perfect and intended for use by all fiber artists. I dye all of my colorways to create a 'fractal' effect, a repeating, varied, color effect that repeats within itself, and creates that 'classic' handspun look. This also means that our skeins are sisters, not twins. The spinning process stretches the roving, meaning that the dominant color changes from skein to skein. This is part of the charm! The PostScript line of yarn is dyed in a variety of traditional methods to create solids to match perfectly with your skein of Fully Spun! Hi! My name is Brooke and I am the founder and designer of Fully Spun. Let me know if you have any questions or would like pattern or color choice recommendations. I'm here to help! This partner provides personalized laser printed items. They print my designs on items that I have hand selected and send directly to you! This company spins the roving I have hand-dyed into beautiful yarn!